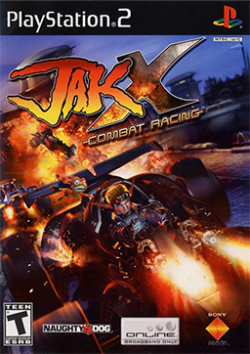 Game description: Jak is back in the 3D combat racing game Jak X: Combat Racing. After saving the world in Jak 3, Jak finds out he must save the word once again; this time, by entering a combat racing tournament. As Jak, you must compete in a handful of game modes while progressing through a nonlinear story. The game includes a variety of power-ups, tracks, and customization options. Multiplayer and online modes are also available. In Jak X: Combat Racing, the player controls characters from the Jak and Daxter series, all of which race in customizable dune buggy-like vehicles. The two main modes of play in the game are Adventure and Exhibition. Jak, the main character of the series, is the only playable character in the Adventure mode, and must participate in a series of Eco Cup Championships in the game's story to obtain an antidote to a poison he and his comrades have consumed. USA v02.20(10/02/2006), Playable with a patch. Patch available here (NTSC and PAL).